1. Anna Rebecca James: born August 6, 1834 in Byberry (later incorporated in the 23rd Ward of Philadelphia, Pennsylvania); married November 21, 1861 in Philadelphia, Pennsylvania to Dr. John-Wesley Thompson (1832-1863); died 1900; known children include: Landreth W. Thompson, M.D. 2. Bushrod Washington James: born August 25, 1836 in Byberry, Philadelphia, Pennsylvania; never married; died January 6,1903 in Philadelphia, Pennsylvania; buried at West Laurel Hill Cemetery, Bala Cynwyd, Montgomery County, Pennsylvania; no issue. 3. Mary Ellen James: born September 15, 1838 in Byberry, Philadelphia, Pennsylvania; died April 5, 1842; no issue. 4. William Henry James: born August 17, 1841 in Byberry, Philadelphia, Pennsylvania; married September 19, 1867 to Sarah Eleanor Levake; known children include: William Edwin James, Anna Gertrude James and David Bushrod James, M.D. 5. John Edwin James: born January 18, 1844 in Somerton, Philadelphia, Pennsylvania; first marriage December 2, 1869 to Maria L. Eveland (-1871); second marriage in 1875 to Eleanor R. Sinn; died February 16, 1910 in Philadelphia, Philadelphia County, Pennsylvania; known children through Eleanor R. Sinn include: Eleanor A. James Ross, John Edwin James, Jr., M.D., and Florence W. James. 6. Henrietta Maria James: born April 15, 1846 in Byberry, Philadelphia, Pennsylvania; married January 27, 1870 to J. Wilson Moore; known children include: Laura Amanda Moore. 7. Melinda James: born March 14, 1852 in Byberry, Philadelphia, Pennsylvania; died March 19, 1852 in Byberry, Philadelphia, Pennsylvania; no issue. 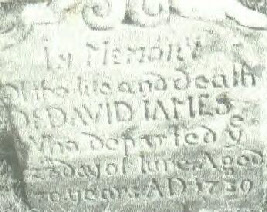 David James was the son of Isaac James (1777-1874) of Radnor Township, Chester County, Pennsylvania and Henrietta Potts (1780-). Bushrod Washington James received his degree of M.D. from the Homeopathic Medical College of Philadelphia in 1856. He served as a volunteer surgeon at the Battle of Gettysburg in July 1863. In 1874 he was reported as practicing medicine in Philadelphia. William H. James studied law in Philadelphia and was a successful counselor-at-law in Franklin, Venango County, Western Pennsylvania. John E. James graduated from the University of Pennsylvania in 1866 and from Hahnemann Medical College in 1886. He became a physician and partner in his father’s medical practice in Philadelphia and was a professor of gynecology at Hahnemann Medical College. He died February 16, 1910 from a paralytic stroke. Of the grandchildren listed above: Landreth W. Thompson was born November 5, 1862; William Edwin James was born July 28, 1868 but died of drowning April 11, 1873; Anna Gertrude James was born November 9, 1871; and, Laura Amanda Moore was born January 21, 1873. Memorial of Thomas Potts James Who Settled in Pennsylvania, by Mrs. Thomas Potts James, 1874, pages 317, 318 and 345. Autobiography of Reverend Isaac James, M.D. (1869) Transcribed by Reverend Joseph F. Di Paolo, February 2006. Obituary of David James (1805-1873) as reported in the Philadelphia “Evening Bulletin” June 9, 1873. Cleave’s Biographical Cyclopedia of Homeopathic Physicians and Surgeons. Obituary of John E. James, M.D. published in the “Christian Republic,” Volume 4, No. 11, Page 3 (Nov. 1910). Biography of John Edwin James (1844-1910) published in “History of Homoeopathy Biographies” presented by Sylvain Cazalet.